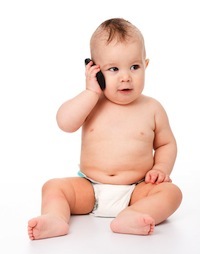 Will Your Cell Phone Hurt Your Baby? It might, according to a study from the Yale University School of Medicine. The study involved lab mice, not human babies, but the mice exposed to simulated cell phone exposure while in the womb developed behaviors that resemble attention deficit hyperactivity disorder (ADHD) in human kids. The same area of the human brain that’s affected by ADHD is the same part of the mouse brain that was affected by the cell phone exposure. According to Dr. Hugh S. Taylor, the Yale study “is the first experimental evidence that fetal exposure to radiofrequency radiation from cellular telephones does in fact affect adult behavior.” In addition to being senior author of the study’s findings, Taylor is a Professor and Chief of the University’s Department of Obstetrics, Gynecology & Reproductive Sciences’ Division of Reproductive Endocrinology and Infertility. One group of mice were placed in a cage that had a cell phone, silenced and muted, positioned above the cage. For the duration of the experiment, the phone was actively engaged in a phone call. The other group - the control group - was caged similarly, with a silent, muted cell phone positioned above but the phone used on this group was deactivated (no call in progress). The offspring of the mice in the cage with the actively engaged cell phone developed neurological changes in the neurons of their brains’ prefrontal cortex region. This is the same area of the human brain affected by ADHD. Children with ADHD and the mice exposed to the cell phone’s radiofrequency radiation experienced similar behavioral disorders, including hyperactivity and inability to focus effectively. It is interesting to note that the number of diagnoses of ADHD in children has risen in recent years as the popularity of cell phones has increased. Also, pregnancy in a lab mouse lasts only 19 days and mice are born less neurologically developed than humans. These noteworthy differences lead the research team to suggest the need for further research, including research involving humans. In future studies already being planned, cell phones will be replaced by electromagnetic field generators that can be more precisely calibrated than cell phones can. In addition to Taylor, the research team included Tamir Aldad, Geliang Gan, and Xiao-Bing Gao. Source: Peart, Karen N. “Cell phone use in pregnancy may cause behavioral disorders in offspring.” YaleNews. Yale University. Mar 15, 2012. Web. Dec 23, 2013.